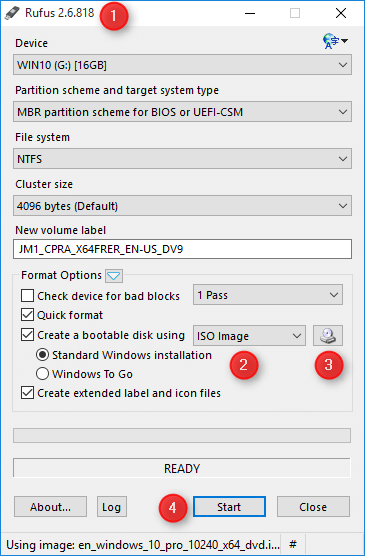 Create Windows 10 ISO Bootable USB in a simple way. The tiny size of devices making Optical drives being put off. For example, an absence of optical drive (i.e. DVD-Bluray drive) in Windows-powered tablets. It will also serve as a backup copy. There are lots of tools available to create bootable flash drive. We recommended Rufus utility. It has a really easy user interface with single window operation. Means user does not need to go through the lengthy wizard process. Of course, you need a working Windows Setup file in ISO file and USB flash media. Please keep in mind this process will format your USB flash drive. So confirm, you have backup important files to the safe place. You can access the log file seamlessly by clicking on Log button. It will be helpful in case any obstacle found. Advanced users may play with additional setting to trick installation process. I’m giving screengrab of Windows explorer for bootable USB flash drive. We hope it will helpful to create Windows Bootable USB Drive. You can share any feedback in comments section. It may helpful to other users.